A no-sweat (we promise) cute craft that has big impact. We love a good DIY art project (so much that we have a whole series with our very own Steven Sabados devoted to them! ), but we'd be lying if we said we never talked ourselves out of starting one due to pure intimidation. If you're anything like us, this easy, Origami-inspired washi tape art is exactly the type of endeavour you've been waiting for. Taping and tracing are the only skills required, and in minutes you'll be left with a bold, graphic design that'll add a burst of colour to any wall in your home. We chose a heart for ours — it makes the perfect decoration for a Valentine's bash — but you can customize the shape and colours to your personal taste for a truly one-of-a-kind piece you won't sweat, promise. Grab a large sheet of craft paper and carefully cut out the desired shape of your tape art. You'll be using this to create your outline. We went with a heart, since it's almost time for Valentine's Day! Using masking tape, stick your craft paper to the spot on your wall where you'll want your tape art to live. Mark all the corners of your craft paper shape with a pencil, then remove the paper from the wall. 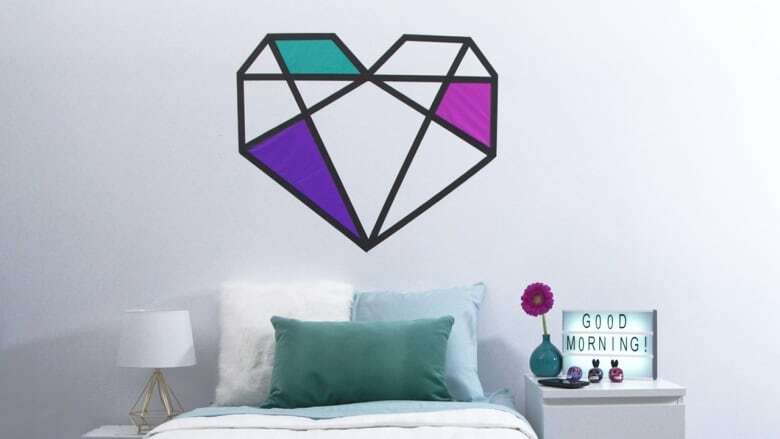 Connect the dots on your wall using washi tape to create the basic outline of your shape. Then, use strips of tape to create your own unique pattern within your shape. Select a few taped-out sections within your shape to cover with layers of tissue paper. Hold tissue paper up to the section you want to cover and trace it, before carefully cutting out your pieces of tissue. Holding the tissue in place, tape around the edges to fasten it to the wall. Repeat for each section you want to cover. Step back and admire your gorgeous piece of wall art.